Of course you are aiming for a YES. But when you get a NO, remember, all NOs are not the same. As you begin your hunt for customers, you will come across many who are not interested in your offerings. Perhaps the price is wrong or perhaps you are not solving a problem they have. However on the spectrum of NOs, you should be happy if you get a straight out NO! This is the best case scenario as it saves time and wasted effort. 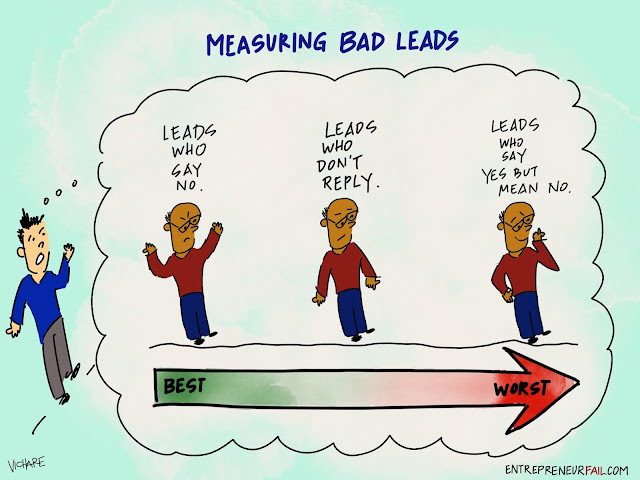 Continuing on the range of bad leads, next come the potential customers who just don't respond. You may send emails, make phone calls, get referrals, ping them in other ways, but you'll get no response. You may think of giving up, or you may choose to be persistent, but either way, these bad leads are frustrating. Finally, the worst are the leads who give you a false sense of hope. These are the folks who casually say "maybe" or "let's discuss", but they have absolutely no interest in ever buying your product or service. Be wary of these potential customers as they will spend your time and you'll get nothing in return. Who are the worst leads you've dealt with? Let us know in the comments below.